There has been a lot of controversy over the health benefits of soy in recent years but even its detractors seem to say that eating moderate amounts of fermented soy products – like miso, tempeh, and natto – is okay. I love tempeh, especially when browned in a bed of caramelized onions and garlic and paired with a vegetable like broccoli, winter squash or sweet potato. When I need a bulkier meal, I eat this with brown rice pasta. You can use tempeh in wraps, salads – anywhere you like. It’s got a deep nutty flavor that complements the light freshness of vegetables well. Sauté chopped onion in olive oil until translucent or caramelized. Add garlic and let cook for a minute or two to flavor the olive oil. 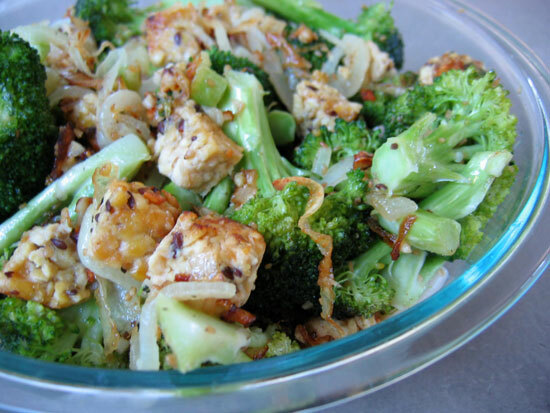 Add the tempeh and broccoli, sprinkle with gomasio to taste, and cover. 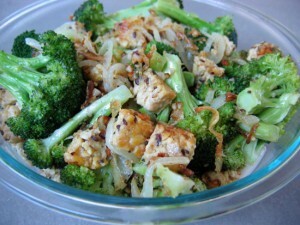 Turn the tempeh so it browns on all sides and make sure the broccoli does not burn. Cook for approximately ten minutes, or until broccoli is tender to a fork’s touch but not overdone. Serve and enjoy. Hi there. Thought everyone would like to know about our easy method for making tempeh: makethebesttempeh.org. We produced Betsy’s Tempeh in Mich. for 9 1/2 years and developed a new way of making tempeh without using plastic bags. We would love to see small worker owned food coops produce tempeh for the local community while working with farmers to grow the organic beans. Hi Betsy! Thanks so much for sharing your website and vision with our readers. I love your idea of small worker owned coops working with local farmers. Very cool! !